Disability Rights Association of Goa is a registered charitable society recognized by the Directorate of Social Welfare, Government Of Goa. 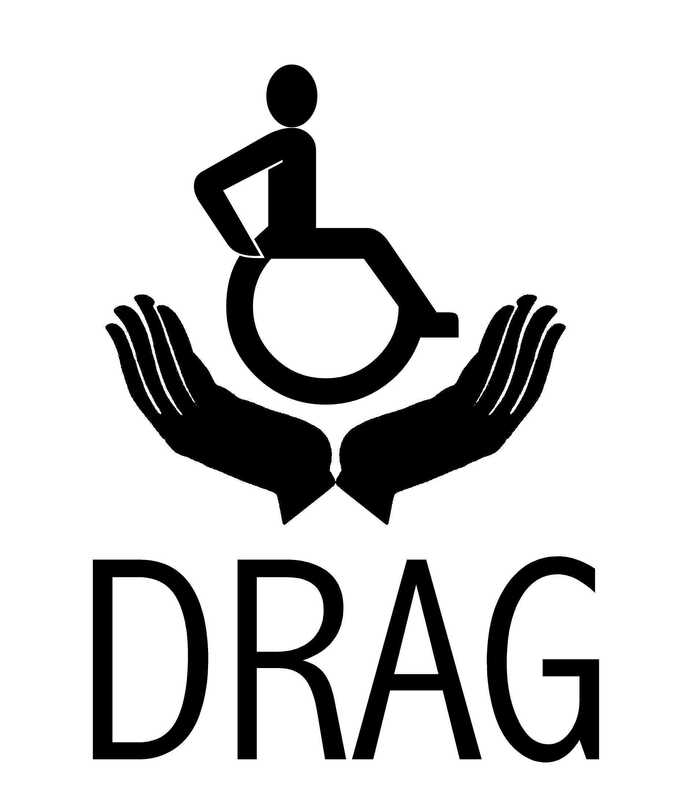 It was started in October 2003 by persons with disability with the main objective of bringing persons with disability into the mainstream society. Goa has 33,012 persons with disability as per Census 2011, out of which 17,016 are males and 15,996 are females. Out of the 33,012 persons with disability, 4,964 (15%) persons are with visual impairment, 5,347 (16%) persons are with hearing impairment, 5,578 (16%) persons are with mobility impairment, 1,817 (6%) persons are with intellectual impairment, 5,272 (16%) persons with speech impairment, 1,675 (5%) persons are with mental illness impairment, 2,575 (8%) persons are with multiple disabilities and 5,784 (18%) are with any other disability like learning disability and autism. The Census 2011 states that there were 15,749 persons with disability in Goa. The total number of persons with disability in Goa as on 31st March, 2018 is estimated at 40,000 persons with disability with the introduction of the new Rights of Persons with Disability Act 2016 which has increased the number of disabilities from 7 to 21. Goa State Award 2007 for the Best NGO for the Welfare of the Disabled in Goa. Nominated for the Navhind Times Viva Goa’s Goan Achievers Award for Best NGO for Social Empowerment for the year 2010. ♦ Ensured that the rights of persons with disability as mandated under the various laws for persons with disability are protected. ♦ Taken up various disability issues with the State Government. 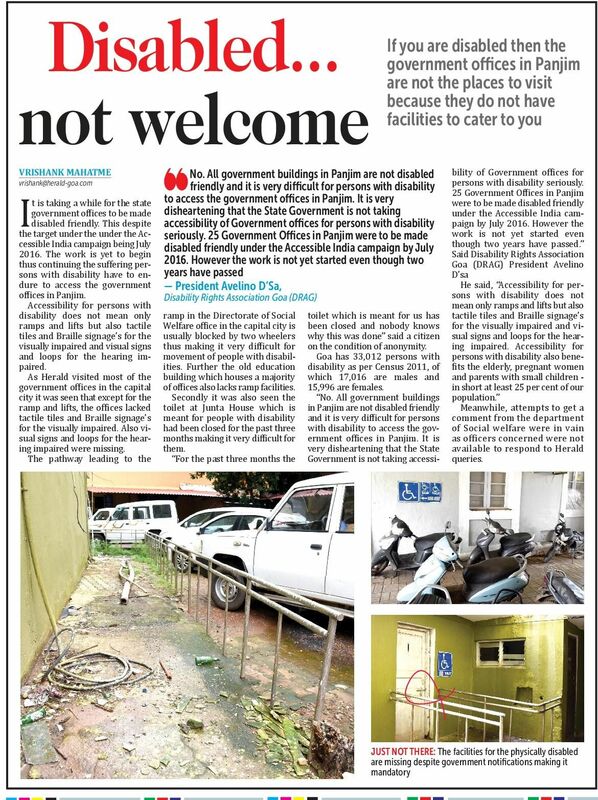 ♦ Been responsible for public buildings in Goa having barrier free access for persons with disability. ♦ Organized World Disabled Day in the open wherein children from various schools / NGO’s for persons with disability participated. ♦ Participated in the formulation of the Goa State Policy for the welfare of persons with disability. ♦ Been responsible for the Increase of income limit for persons with disability from Rs. 25,000/- to Rs. 1,20,000/- p.a for the purpose of availing benefits from the State Government (presently the limit is Rs. 1,50,000/-). ♦ Been fighting for recruitment of persons with disability in government service, as per the reservations provided in various laws. ♦ After a prolonged battle of one year with the Entertainment Society of Goa, been successful in getting a lift installed in Maquinez Palace, the main venue for the International Film Festival of India (IFFI) and making IFFI barrier free for persons with disability. ♦ Organized seminar on the United Nations Convention on the Rights of persons with disability. ♦ Organised disability awareness campaign BADHTE KADAM an initiative of National Trust for welfare of persons with autism, cerebral palsy, mental retardation and multiple disabilities in various parts of Goa in collaboration with the NGOs in the disability sector in Goa to create awareness on the rights and schemes for persons with disability. ♦ Organised motivational programme LIVE LIFE for persons with disability and special educators conducted by internationally renowned motivational speaker Prakash Rohera. 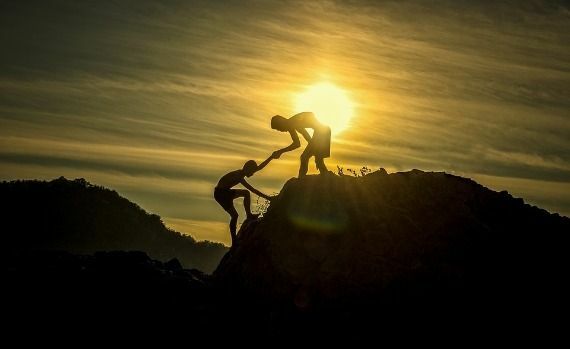 ♦ Organised annual picnics for persons with disability to build fellowship among the members Organised WE CARE Film Festival on disability issues to sensitize school and college students on disability issues. 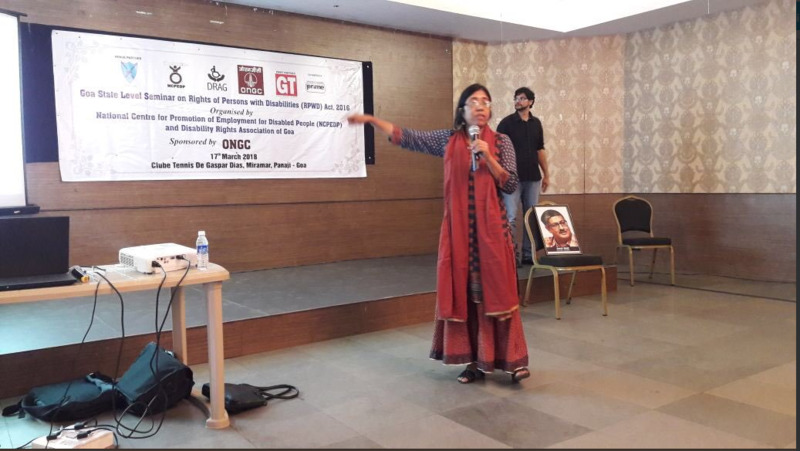 ♦ Organised State Level Seminar on the Rights of Persons with Disability Act 2016 in association with National Center for Employment of Persons with Disability, New Delhi.